After a less-than-auspicious start to my new practice of going to Tramore hurling matches it seemed only fair to give them, and the lowest rung of our beloved sport, another chance. So it was that we (I’ll get back to the ‘we’ in a moment) found ourselves in Portlaw on Sunday morning for the clash between Tramore and Portlaw in (it says here) the Eastern Hurling League Group 1. I emphasise this because I’m right confused as to what the EHL is. Initially I assumed this was Tramore’s second team playing Portlaw’s second team, but a friend of my older brother was there and he explained that this was mostly Tramore’s main team playing mostly Portlaw’s main team. I’d probably head over to the Waterford GAA thread on boards.ie and ask how exactly the club scene works, but after my recent bollocking I’m probably persona non grata, so if some kindly soul reading this could explain it to a prodigal GAA son then I’d be most grateful. As I noted earlier, the plural in ‘we’ was significant as it included my two nephews. Trying to keep a 4-year-old and a 2-year-old under control meant that I could never be 100% sure of the score, and it duly appears that I was wrong (see accompanying image), missing a Portlaw point early on. I mention all this because maybe it was possible that I was right and the referee was wrong . . . no, not a chance. Having seen a referee undergo a minor nervous breakdown a couple of weeks ago, it was refreshing to see Robert Dunne engage in an exercise in how it should be done. Constantly up with the play, understanding of the difference between filthy play and the merely careless (without giving such carelessness a free pass), and happy to explain his decisions without attempting to be all chummy with the players in the mode of Dickie Murphy, it was a relief to see that good officiating exists at the lower ends of the GAA. And while the GAA Scoreboard might be a great app – certainly an improvement on the inside of a packet of Major cigarettes, the choice of the discerning scorekeeping spectator in days of yore due to its non-glossy paper – there’s no substitute for, uh, giving the game your full attention. For there was a game here, and unlike the Tramore-Bonmahon game it was played in the right spirit from the off. It may seem incongruous to reference the Champions League final between Bayern Munich and Borussia Dortmund the previous evening, but both games showed how important the mindset of the respective teams is in creating an entertaining spectacle, for just like the soccer game this was surprisingly enjoyable fare. It’s probably just as well that Eamon Dunphy didn’t see it though as Portlaw cut Tramore to ribbons in the opening stages. At one stage I wondered whether Tramore were playing with 14 men, appearing to be physically one short in the full-forward line and mentally one short in every other line as Portlaw got to every ball first and were able to offload with ease. A quick count told me the awful truth – Tramore were simply terrible, and the scoreline of 3-11 to 0-2 after about 20 minutes was ample testimony to that. Then something strange happened. Tramore’s tiny corner-forward, the same chap who got cleaned out in the previous match that caused the referee to walk off the pitch, or if not him then this twin brother, scored a marvellous Mullanesque over-the-shoulder score and Tramore suddenly went nap, rattling over three further scores without reply to take the bare look off the scoreboard by half-time. You could also see how Tramore’s spirits were lifted by a stunning save by the goalkeeper right at the start of the second half, and the moving of Tramore’s number 6 yielded almost immediate dividends when he pounced on a mis-hit free for a goal. It was soon evident that he was the star of the show for Tramore as his possessing of excellent ball-winning ability and the vision to pick out a teammate in space allowed Tramore to at least keep up with Portlaw on a point-for-point basis. Thus when the Portlaw goalie made a horrible blunder in dropping a routine catch right on his own line – who’d be a goalkeeper? – to gift Tramore a second goal, the gap was trimmed to nine points and for one brief moment you wondered whether we could pull off an astonishing comeback. What’s this ‘we’ business, pale face? When it looked like Tramore might be good it becomes ‘we’, eh? And, alas, ‘we’ weren’t having these thoughts for long as a fourth Portlaw goal put the kibosh on them. The game petered out after this, an off-the-ball incident which had the Tramore bench in an uproar and led to what looked like a conference between the various parties on how to deal with it being the most noteworthy incident – another sign of the difficulty of having only one official at a game, and this was a much more civilised way of dealing with it. Overall, it was a great experience. I expected to feel kinda pleased with myself for making a contribution, however small, to grassroots of the GAA rather than just turning up in Thurles and Croke Park a couple of times of year. No less a figure than John Galvin was an umpire on the day, so to be following in the footsteps of as legendary a Waterford Gael as himself was very satisfying indeed. What I couldn’t have hoped for, or at least demanded, was that it would be such an entertaining sixty minutes of sport. I wasn’t being facetious when comparing it to the Champions League final. Two teams evenly(ish) matched, keeping it clean, and attacking at every opportunity is a recipe for a good spectacle, and if the stakes weren’t quite so high nor the stage as cathedral-like as Wembley, it was still worthwhile. Did Homer not make the Iliad from such a local row? There was also an unexpected bonus. I’ve often wondered whether I was a small bit thick that I couldn’t read the game in the way someone like Giveitfong can do. I put it down to getting too caught up in the intensity of Waterford matches to take time to analyse the game properly. That, and being a small bit thick. This may still be true but watching this game, in so far as I could with having to keep an eye on Ernie and Bert (NB not their real names), was most revealing. Not only were we close enough to literally touch the players if you had a hurley in hand, but the slower pace at this level meant you could understand so much more. Gaps in lines became obvious. The players who were on top stuck out, as did the players who were struggling badly. So this is where you learn about the game! You learn a new thing every day . . . many more lessons needed. 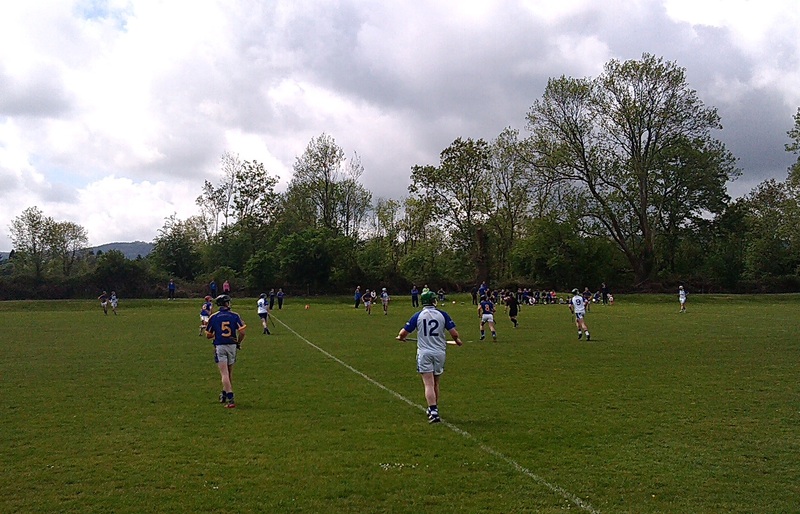 This entry was posted in Match Reports, Waterford and tagged Junior, Portlaw, Tramore on 27/05/2013 by deiseach. A few years back I found myself in the surprising position of having to account for something that I had written, surprising because normally no sod reads any of it. This came about when I wrote a rather snotty report on the experience of watching Waterford United take on Roy Keane’s Ipswich Town in a friendly. While it was easy to be dismissive of the offensive comments and the abuse I got on BTID at the time, it was more difficult to do so with the response of FootballPress, a League of Ireland blogger around the time (his site is no longer accessible). He noted that the gist of my argument was that I’d have enjoyed myself had the surroundings been as plush as Anfield and the passing ability on show been to the level of Xabi Alonso. Harsh, but fair. The ref, who turned up fifteen minutes late, completely lost the plot. Abandoning any game after only three minutes is crazy. It would have been helpful for the purposes of full disclosure had I noted that the game had started late. When the game threw in at 7.45pm, I immediately discounted it as the kind of thing that happens all the time at games not shackled by the need to satisfy television advertisers. I overheard after the game that he had been late because he had not finished an underage match taking place on the lower field. Whatever it was, you could conceivably make the argument that players were frustrated waiting for the throw-in, so the ref should have shown more discretion when the game erupted as it did. On balance, I don’t find this convincing. Players were not hanging around shivering in driving wind and rain. This was a reasonably pleasant early summer evening, ideal for hurling. They hadn’t been sitting in the dressing room getting increasingly agitated or whipped into a frenzy by a hostile crowd. There was no excuse for the instant outbreak of hostilities at the throw-in and the players would do well to accept responsibility for their own actions rather than deflecting it onto the beleaguered official. The radio silence from both clubs – at the time of writing there is no reference to the truncated game on the website or Twitter feed of either club – suggests they’re not comfortable talking about it either. These kind of bust-ups happen at Senior level too, so why pick on Junior hurling? Appalling scenes at Walsh Park where all 30 players (Ballygunner/Roanmore) got involved in an early scuffle. No-one sent off. In short, I’m not sorry for thinking the antics of the two teams at the Tramore-Bonmahon game were ridiculous. I am sorry for thinking this was somehow endemic to the Junior game. Now can we all be friends, like I am with the Blue ‘Til I Die crew? This entry was posted in Hurling, Waterford and tagged Bonmahon, Tramore on 13/05/2013 by deiseach. Last weekend one of my brothers had the bright idea of heading down to Dungarvan to see De La Salle play Ballyduff Upper in the county championship. We got to see two of the better club sides in the county – quite possibly in the country – serve up a tight affair which was in doubt until the last few minutes. It was hard but it was fair and we were able to watch the game without any of the stress that comes with being a partisan observer. Throw in a balmy early summer evening and the oft-charming surroundings of Fraher Field and it was well worth €10 of anyone’s money. Having also taken in the Blues at the RSC the previous evening, another frustrating late goal denying us all three points against Longford Town, I was beginning to fancy myself as Mr Waterford Sport so when I saw on Twitter that Tramore were playing Bonmahon in the Junior county championship, it seemed like a very bright idea to go down and check it out. Having negotiated the entrance to the pitch, where I seriously wondered whether the GAA in its wisdom might insist that every club game of any description should have a €10 entry fee, my Tramore-based brother and I settled down on pitchside cackling about how we’d probably have our heads taken off by a flying hurley. The brother, a decent player in his day (Sonny Walsh Cup winner) expressed his belief that he would never have been cut out for the rough-and-tumble of what we were about to see. This would turn out to be prophetic. Within the first minute one Tramore player got caught on the head with a hurley, then the Tramore centre-back took a wild hack when his opponent had put his hand down to pick up the ball. As the ref was trying to sort this out an almighty ruck broke out in the middle of the field. This was serious sabre-dancing, two players giving each other forests of timber. Had there been linesmen both would have been red-carded but there was no way the lone official could tell who had done what so he handed out a lecture and left it at that. The next flashpoint saw the Bonmahon centre-back plough into Tramore’s advancing corner-forward, a purely cynical tackle on a player half his size that caused the ref to snap. “None of ye want to play the game, so just forget about it”, he said and marched off towards the dressing room with the demeanour of a man who wanted to tuck his hand into the breast of his uniform. It looks mad 24 hours after the event that the ref would abandon the game after just three minutes, so it’s important to emphasise how correct it felt at the time. You could understand, while not approving of, a game descending into anarchy as events unfolded. Conditions are poor, decisions are contentious, tempers fray, and all hell breaks loose. But this was two teams going at each other right from the throw-in, red of tooth and claw. And it wasn’t as if this was the Gaelic games equivalent of Galatasaray v Fenerbahce or Al Ahly v Zamalek. Tramore v Bonmahon, for Christ’s sake! If the coaches were sending out their teams with fiery speeches about socking it to that shower a few miles up the coast then they need to be locked up for the safety of the entire populace. I’m guessing this game isn’t typical of Junior club hurling. An old school friend I spoke to after the game didn’t seen to think it was. Still, it’s irritating to see a pernicious stereotype about the GAA, that (to paraphrase Rodney Dangerfield) you would go to a boxing match and a hurling game might break out, being given form in such a dispiriting fashion. If it is typical, I think I’ll stick with games where there are multiple All Stars on the field. This entry was posted in Hurling, Waterford and tagged Bonmahon, Tramore on 11/05/2013 by deiseach. The idea that 2013 would be a year where Waterford sports fans would come to wish the Mayans had been right has been rattling around in my head for a while now – have headline, article to follow. It was a decent 2012 at Senior level for the hurlers, with an entertainingly miraculous escape in the League and a respectable run in the Championship, and De La Salle showed we are still competitive at club level. It was calamitous everywhere else though, with near-record beatings at Minor and Under-21 level. Then winter compounded the misery as the Intermediate and Junior champions went down at the first hurdle in Munster for what feels like the umpteenth time. Looking forward to 2013, the League looks like being a complete bust. We managed to beat Dublin and Galway last season to survive, the former being replaced by a resurgent Clare and the latter transformed into the team most likely to overturn the Evil Empire. With the retirement of Eoins Kelly and McGrath, and uncertainty over the future of John Mullane and Tony Browne (the reason I never said anything about the retirements of the two Eoins at the time was because I was expecting to be folding it into a eulogy for Tony’s monumental career), you begin to wish the calendar really did run out in 2012. Add in the financial apocalypse which looms over the county like an impending apocalypse and you have a neat segue with Waterford United’s woes. The threat by John O’Sullivan to jack in his involvement in the club has proven to be an empty one. He probably underestimated the extent to which those running the League of Ireland couldn’t care less about what happens outside the Pale and the Blues now find themselves, after a year spent in a division which everyone agreed was unsustainable with only eight teams, preparing for a year in a division which might have only seven teams! There’s an assumption that Cobh Ramblers will step into the breach, which would obviously suit Waterford as another derby-like game, but the fact that there being no fixture list for the First Division with less than two months to go before the season kicks off is taken with such sang-froid rather than causing utter hysterics in the domestic game shows how resigned the denizens of the First Division are to their circumstances. Let’s hope by 2014 we’ll be able to say the same for Ryan and Ethan. This entry was posted in Hurling, Soccer, Waterford, Waterford United and tagged Tramore on 17/01/2013 by deiseach. It seems a shame that not enough is made of this location. 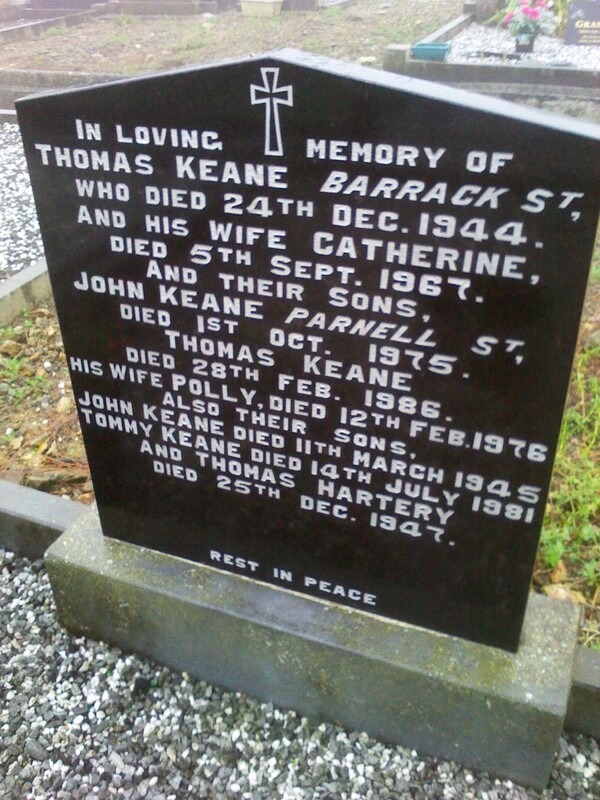 Then again, that would run counter to the minimalist nature of the final resting place of John Keane. One final personal observation. Speaking of this discovery to my father I mischievously noted that it was strange that my grandmother, who had a seam running through her consisting of pure antipathy towards Mount Sion, would thirty-three years later consent to be interred in the same ground as their greatest legend. “Sure, she liked him,” said my father. Truly a man like none other. This entry was posted in GAA, Hurling, Waterford and tagged John Keane, Mount Sion, Tramore on 01/11/2011 by deiseach. It is with a heavy heart I write this letter, to highlight the level of cronyism that exists in underage GAA in my locality and I am sure throughout the length and breadth of Ireland. This should be a happy and exciting time for U14 players waiting eagerly for the start of the Féile competition, especially the ones who have been training like senior inter-county players since last winter! I am a parent of one of those boys who has given 100% commitment in attendance and training all year, whose ‘work-rate’ is second to none and whose position on the team at present is unquestionable. Yes, I’m sure you are saying to yourself ‘here we go again, another mouthing parent saying how their Johnny is being discriminated against’. However, this is not the case. I have no illusions about my ‘Johnny’. He is not the star player, and never will be, but he makes a valuable contribution. He has heart, drive, motivation and skill; as a team player, he is always eager to share the ball. This has been noted by many spectators and parents on numerous occasions. My son is diabetic and has to work as hard off the field as on the field, especially on days of training and matches to adjust his insulin-injections and food consumption in order to boost and control his energy levels. However, he never dwells on this, nor would he ever use his diabetes as an excuse to miss training, even if it meant occasionally having to give an extra injection. My heart hurts as I recall how my son and another member of the U14s were dropped off the team last week for one of the championship matches, without notice, cause or reason. I can still see my son’s face of bewilderment and frustration at this injustice. Regrettably he’s now contemplating giving up hurling. I am all for putting out your best team and this should always stand; equally I believe that anyone who is not performing should be taken off and a sub put on in their place. It is only right and fair. U12 hurlers of late have been replacing U14 players on the team, not all of them for their greater ability or skill, but due only to cronyism. There was huge speculation and disapproval by many parents and spectators at the dropping of U14 boys, who only have one chance of competing in this Féile na nGael 2010, whereas U12 players will have two more years of competing in it. I am full of admiration for the extraordinary work, time, effort and commitment that trainers voluntarily put in, working with our young people at underage level. I myself am privileged to work with young people on both a professional and a voluntary basis. However, this issue is bigger than hurling. We do not and should not have a free rein. We are accountable to these young people at this very vulnerable stage in their lives. We cannot shatter their ideals and beliefs and make them think that integrity, performance, work-rate, dedication and commitment don’t matter . . . it’s just who you are and who you know. This is fundamentally wrong. We have a duty of care and a responsibility to promote fairness and positivity in these roles that we hold. We must encourage and tell them how wonderful and great they are as it is so important to praise young people rather than to criticise them. My husband is a fair man and very impartial but was gutted by the incident last week. His words of consolation were ‘sure it was the same in my day’. Well, it should not be the same in this day and age. It is high time that the GAA had a good look at how underage management and coaches are trained for the privilege they hold, working with and training our young people. In order for personal, social and cultural development amongst our young people to flourish, emphasis must be put on proper and appropriate means for teaching the skills of our native sport through fair, fun and friendly methods and cronyism must be abhorred. I remember this feeling all too well. We were playing a match in Mooncoin and being massacred as usual – quite ironic on the evening when Waterford took a bit of a beating there tonight. Our coach took a player off and waved in the direction of the subs for someone to go on. We had a conference of sorts and agreed he was waving at me. I pulled on one of the handful of shirts we had amongst us and ran on. Moments later one of my fellow subs trotted up behind me and informed me that it seemed it was him who was meant to come on. At the time I didn’t think too much of it – it’s not as if there was a crowd there to revel in the car crash. But a few games later I realised I hadn’t pucked a ball in anger, the only one on the panel who hadn’t. I told him that I didn’t see the point in coming down any more if I couldn’t get a match even when we were being stuffed to which he replied “yeah, you’re probably a bit young” (not true, there were several younger than me). It was difficult to choke back the hot tears as I climbed into my mother’s jalopy that was spiriting me away from the horror and I took a very jaundiced, nay, rancid attitude towards the GAA for a few years after that, only being rescued by the euphoria of Waterford winning the All-Ireland Under-21 title. I’m not saying I was any good. I was absolutely useless: wrong hand on top of the hurley, no left side, utterly cowardly in the clash. The usual caveats about admiring the work done by underage coaches absolutely apply to our one, a man who has given far more to the world in his work for the club than he ever took out of it. But I had enthusiasm to burn, and to manage to burn through all of that before the age of 15 was quite an achievement. The GAA doesn’t have the luxury of soccer and rugby of being able to piggy-back on the efforts of others in the sport throughout the world. No one could do a tap to nurture soccer in Ireland and people would still want to play the game to emulate the likes of Lionel Messi. Good luck trying to get the next John Mullane if the next John Mullane has no one to take on. This entry was posted in GAA, Hurling, Waterford and tagged Tramore on 09/05/2010 by deiseach. During the week I received an all-too-rare comment, a post from HURLER saying that “Ruairi Og will hurl you’s off the park on sunday…” After getting over the initial sarky amusement that someone had homed in on a Googled reference to De La Salle (the school) being the All-Ireland champions (last year), I wondered who ‘Ruairi Og’ was, clearly the latest great white dope of Antrim hurling. Which (and I’m thinking of making this the motto for this website) shows you what I know. Ruairí Óg is the name of Cushendall GAA. There’s a doctrinal thesis out there waiting to be written on the historiography of GAA club names, and a whole chapter could be devoted to why people come up with names that are never used. I’d heard of Cushendall yet I don’t feel one bit embarrassed that I didn’t know their real name (any more than HURLER should feel embarrassed by not knowing the distinction between the two DLS’s, it should be noted). One of the great clubs of recent times, St Mary’s, are known to absolutely no one as that. And my own club trade under the mouthful that is Michael Mac Craith, a name that I’ve only ever seen unaccompanied by the pregnant explanation that it’s Tramore on the clunky old scoreboard that they used to have in Walsh Park. So will it be Ruairí Óg (Cushendall) or De La Salle (club) winning through on Sunday? Waterford clubs hold no fear for Antrim clubs, as Dunloy demonstrated in beating Mount Sion in 2003. But De La Salle have shown that they are not hamstrung by the demons that have held back Waterford clubs over the years. I’ll stick my neck out – based on the aforementioned lack of nerves and their gradual ascent towards the top meaning their presence here is no fluke, De La Salle to win. Either way, thanks to HURLER for his / her interest, and best of wishes to the good folk of Cushendall. This entry was posted in Hurling, Waterford and tagged Antrim, Athenry, Cushendall, De La Salle, Dunloy, Mount Sion, Tramore on 21/02/2009 by deiseach.